Large Christmas Santa Sack in festive red fleece complete with a white rope drawstring top. 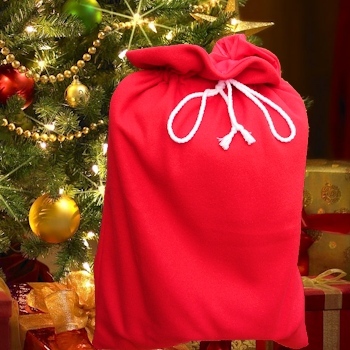 Large Christmas Santa Sack in festive red fleece complete with a white rope drawstring top. Perfect for those expecting a bumper Christmas delivery from Santa this year, a good size sack to hold all of those lovely gifts. Made from red fleece this Christmas sack is soft and bright, and a practical size for wraping larger presents. Large Christmas Santa Sack in festive red fleece complete with a white rope drawstring top. Perfect for those expecting a bumper Christmas delivery from Santa this year, a good size sack to hold all of those lovely gifts. Made from red fleece this Christmas sack is soft and bright, and a practical size for wraping larger presents. A size of 75 x 60cm is perfect for most presents, this Christmas sack is fully lined with a smooth polyester lining for extra strength and durability making this sack a great keepsake for next Christmas too. Check out the Christmas Gifts category as we also offer this sack with the added option for a personalised name.